Giving is easy, we all love to do that especially when it comes to material things. How about receiving? I think we can all state, after looking at the people around us and including ourselves, that we might be pretty good givers, but we fail at the attempt of receiving – gifts, compliments, help, you name it. Well, giving and receiving are key aspects of a complete experience when it comes to human interaction. Imagine if all of us would be great givers, who would receive what we feel the need to give? I know now, receiving isn’t easy, but how can we change that? And this one is a decisive question, not only because of the season we’re in. Let’s look at it this way – How giving to others makes you feel? Do you feel appreciation? How about pride for making another person happy? So, it’s all about you. No problem, we all are kind of egotistic and do things in order to make ourselves feel better. Even when we help others. Let’s stop here for a second and look at the other person. How does he/she feel? Maybe, the thing you just offered saved them a lot of trouble. Or money. Maybe they truly needed your gift. Maybe they didn’t know they need it, and you just made them realize that. Again, it’s not about you – it’s about them. So, why not let them give something back? Why not let them make you feel the way you made them feel? And eventually, in the most egotistic form, let them be like that for a change! Let them feel great for giving. My personal opinion? I think we don’t know how to receive anything because of one single reason – We don’t know our worth. We don’t know what we deserve and we can’t accept the fact that someone figures it out (figures us out) better than ourselves. In the end, isn’t all of this about us and us only? The next time you find yourself in a situation like this, remember the next: Those two – giving and receiving – should be a part of our daily experiences. If the giving part comes natural and we don’t always analyze its benefit, the receiving one is vital to our mental balance and spiritual connection. Life tip: Accept compliments, enjoy gifts, appreciate the people you have around, make the most of every little thing that is given to you! How can you do that? Improving your communication skills would be an idea. 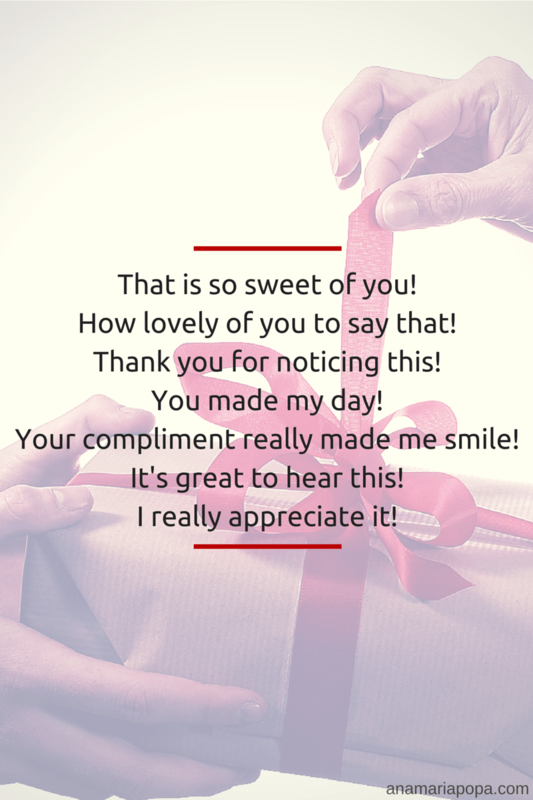 A ‘thank you’ is nice, but how about ‘That is so sweet of you to say that’ or ‘I really appreciate you noticing that’? If you’re bold you can even try an ‘You made my day!’.